The premiere of the highly-anticipated “Terra Nova” has finally arrived, and there is a lot to discuss. I can sum up the bulk of my interest in “Terra Nova” with a single word: “Dinosaurs”. Forgive me for making such a gross generalization, but really, who doesn’t love dinosaurs? If you are such a person, then I feel sorry for you. Dinosaurs are awesome. These wondrous, often enormous beasts dominated the Earth for over 160 million years. The idea of a TV show featuring dinosaurs seems like a no-brainer (so not surprisingly, “Terra Nova” isn’t the first attempt), but the limitations of TV special effects have made this a difficult prospect, until now. Of course, this isn’t the first time dinosaurs have appeared on television via modern computer graphics. The 1999 BBC miniseries “Walking With Dinosaurs” still stands as the dinosaurs’ finest moment on television, in my opinion (the numerous American knockoffs with inferior CG are hardly even worth mentioning). And I have relatively fond memories of the original “Dinotopia” miniseries. There’s also BBC’s “Primeval”, which I have yet to see any of. Without having seen every TV show/miniseries featuring dinosaurs, I can’t say for sure, but I’m fairly certain that “Walking With Dinosaurs” remains unsurpassed in regards to special effects and overall quality. The first thing that many may want to know is how good “Terra Nova’s” highly-touted CG dinosaurs are. Are they movie quality? Definitely not, even by today’s standards. Of course, I’m of the opinion that all movie dinosaurs have thus far failed to live up to the standard set by the “Jurassic Park” movies. Yes, modern dinosaurs, such as those seen in Peter Jackson’s “King Kong”, are much more advanced. But unlike the special effects teams of the “Jurassic Park” movies and “Walking With Dinosaurs”, modern animators seem to forgo any attempt at animating large creatures with any sense of realism (incredibly unbelievable physics have often been my biggest issue). But in regards to “Terra Nova’s” dinosaurs, it would be unfair to judge the special effects by “Jurassic Park’s” standards. The dinosaurs in “Terra Nova” aren’t as jaw-droppingly excellent as I (and others) might have hoped. They vary in quality a bit, and have plenty of glaring flaws. They do slightly fall prey to the modern animator’s tendency to give larger creatures unrealistically fast movements (particularly in the Carnotaurus’ case), but they’re significantly better in this regard than the majority of their movie counterparts. Arguably, at least in many respects, these are some of the best-looking dinosaurs seen on TV to date. It’s just too bad that they’re not nearly as groundbreaking and innovative as we all hoped they’d be. Whatever you may think of the quality of the CG, I think what’s most impressive about the dinosaurs is the amount of screentime they have. There’s the initial Brachiosaurus scene, which seems a rather fitting choice for the characters’ first dinosaur encounter, given that Brachiosaurus was featured in that now iconic scene in “Jurassic Park”, when the characters first get to see a living dinosaur (a brilliant moment in audience engagement, given that audiences had never seen dinosaurs recreated so realistically before). And then there’s the Carnotaurus chase scene, and the even longer, climactic scene in which the “Slashers” threaten the characters in the crippled transport vehicle. This is the pilot episode, after all, so it makes sense that they’d want to show off the dinosaur effects as much as possible early on. I would imagine that we’ll be seeing the dinosaurs a bit less often following the premiere. “85 million years ago” puts Terra Nova smack in the middle of the Cretaceous period. I would imagine that one of the more difficult decisions made during the writing of “Terra Nova” was where in the Mesozoic it would be set. “Jurassic Park” was lucky in that it could pick and choose interesting dinosaurs from any time period. But “Terra Nova” has no such luxury. Unfortunately, the writers seem to have given up on scientific accuracy, once they realized how difficult it is to find one spot in time that has enough interesting dinosaurs. Carnotaurus wasn’t around quite yet 85 million years ago, but it’s close enough to be forgivable. And the 85 million years could just be a rough estimate anyway (and it just plain sounds better than 83 million years ago). What’s a little less forgivable is the inclusion of dinosaurs like Allosaurus and Brachiosaurus, which existed back in the Jurassic period; long, long before the founding of Terra Nova. Interestingly, “Terra Nova” has made the understandable decision to introduce hypothetical dinosaurs that have not yet been discovered. It’s a great idea, in my opinion, as it’s highly probably that a large number of dinosaur groups/species (quite possibly even the majority of them) remain undiscovered. Personally, I think they could have avoided including dinosaurs from the wrong time period by relying more heavily on this concept. It would allow them to invent as many cool dinosaurs as they needed. The Slashers are a reasonably realistic, and cool, idea for a theropod dinosaur. Still, it feels a little wrong to complain about these details. The “Jurassic Park” movies had tons of inaccuracies, but how many kids got interested in paleontology (and science in general) because of them? If “Terra Nova” can do the same, then I can forgive it for not being 100% accurate. But enough about dinosaurs. What about stuff like character and plot? I’ll start from the beginning. “Terra Nova’s” beginning is notably impressive, with its sweeping vistas of smog-choked cityscapes in a grim, dystopian future. It’s all a bit darker than I expected from a family show, particularly in its creepy “population control” dynamics; creepy because it’s somewhat believable. I do maintain a sense of optimism that humans will find a way to morally combat overpopulation and preserve the planet before things reach a point of no return, but the Earth of “Terra Nova” in 2149 is an effectively chilling worst-case scenario. In fact, I really hope we see more of this future world throughout the series (though I suspect that this will be impossible, given that the trip through the crack to Terra Nova apparently only goes one way). “Terra Nova’s” premise was widely discussed in the months leading up to the premiere. Even casual viewers must have wondered how the writers would deal with the obvious problems resulting from trying to reboot human civilization 85 million years in the past. The asteroid that wiped out the dinosaurs (well, except the ones that evolved into birds) 65 million years ago isn’t a problem, in my opinion. 20 million years of human development is enough for them to figure out a way to deal with incoming asteroids; especially one that we know is coming long in advance. No, the real problem is with the sheer, paradoxical madness that could result from traveling into our own past and drastically altering it; potentially to the point where the people who originally went back in time never existed in the first place. How to solve this? Alternate universes. Well, they call it a “timestream” in “Terra Nova”, but I don’t know what part of theoretical physics this “timestream” could correlate with but a genuine alternate universe, which branched off from our own roughly 85 million years ago. The 2009 “Star Trek” movie utilized a similar method to create their alternate timeline. This way, the residents of Terra Nova are traveling into a different past. It really is a second chance for the human race to “start over” and “get it right”, as Nathaniel Taylor puts it. It does seem a bit sketchy that sending a probe back in time and not finding it is enough to assume that the probe went to an alternate timestream/universe, unless they had some completely surefire way of knowing that the probe was going to be somewhere and could track it if it wasn’t where they thought it would be. And if they’re worried about the butterfly effect, they probably shouldn’t have sent a probe in the first place. For that matter, how did they discover that the probe had been sent 85 million years into the past (of an alternate timestream), if the crack only goes one way? Does that not apply to radio waves? Communication back through the crack must be possible, or they would have no way of knowing for sure where the crack actually led. I’m rarely interested in television music, but Brian Tyler is doing the music for “Terra Nova”. It’s currently unknown how involved he’ll be after the pilot. Tyler is a brilliant younger composer who has shown a tremendous amount of potential in the post-2000 era with projects like “Children of Dune” and “Aliens vs. Predator: Requiem”, but his potential has been somewhat wasted on most of his more recent projects, as Tyler has been forced to adjust his scoring style to fit a more modern mold. “Terra Nova” seems to align itself fairly well with modern blockbuster scoring sensibilities. But nonetheless, this is above-average TV music, if only because Tyler has utilized a number of live instruments (and possibly even a choir at one point) for “Terra Nova’s” score, which further adds to the big-budget, cinematic feel of the production. One of the things I liked the most about “Terra Nova” was the camerawork and editing. Unlike many TV shows and movies, “Terra Nova” doesn’t rely on an overabundance of shakycam and fast cutting to generate excitement. No, there are lots of nice, steady shots and great crane shots. I was very pleased. These stylistic choices made a huge difference for me, and make a lot of sense when you want to show off all your visuals. And that’s another great thing about “Terra Nova”. Special effects aside, the show boasts an impressive array of sets and outdoor locations (which are occasionally combined with CG backgrounds, usually to good effect). A show that’s willing to construct such massive outdoor sets and film everything in the jungles of Australia earns a lot of respect from me. I’d say that the opening scenes set in 2149 comprise the episode’s strongest material, right up to the excellent scene where a disoriented Jim Shannon finds himself 85 million years in the past, suffering from the effects of over-oxygenation and facing the threatening soldiers all around him. At this point, the show was off to an excellent start. Unfortunately, things start to take a turn for the worse once the Shannons arrive at their new house. The dysfunctional aspects of the family were largely concealed up to this point, where we bear witness to the family drama by way of some painfully hammy dialog. I do need to take into account that this is the pilot episode, after all, so it’s still very possible that the writing and acting will improve as the show progresses. But it’s not off to a very good start. Stephen Lang is, not surprisingly, the stand-out among the cast. He’s easily my favorite character on the show, and I think the character has loads of potential. But I think the character still has some room for improvement. Jim Shannon is probably my second-favorite character/actor on the show. but he has his share of weak moments, which I can’t completely blame on the script. Taylor’s chief of security, Guzman, is interesting, but is mostly a background character in the pilot. The writing and acting are generally disappointing for most of the episode’s run-time, but there are moments where it works. The scenes between Jim Shannon and his young daughter, Zoe, are a highlight. 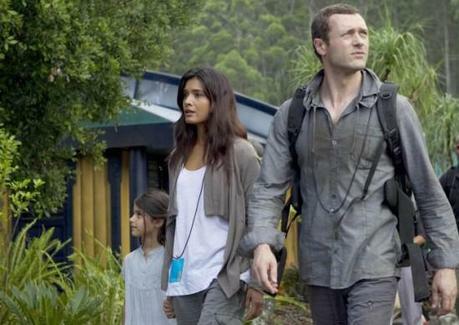 For the most part, Jason O’Mara is a capable and believable lead. But where “Terra Nova” is at its weakest is when it attempts family drama, and virtually anything involving Josh Shannon. Almost no effort is put into making Josh more than a generic, angry teen with daddy issues. It still baffles me that modern writers think that young, ridiculously immature characters will appeal to a younger audience. When I was a kid, I was always more fascinated by the adult characters, like Dr. Alan Grant and Ian Malcolm in the “Jurassic Park” movies; the kind of guys I wanted to grow up to be like. One particularly egregious example of amateurish, downright cheesy writing and acting occurs during the Carnotaurus attack. Lines like “Whoah! Look out!” or “What the hell is that?” don’t have to be all that cheesy, but Jason O’Mara’s delivery there just felt off. But the real kicker was when Taylor replies, in complete deadpan, “Carnotaurus. I hate Carnotaurus.” I had to stifle a laugh. To be fair, Taylor’s line and his over-the-top actions here could be pretty awesome in another context. But up to this point, the show had taken itself relatively seriously, and then this line comes along, out of nowhere, and I wasn’t sure whether it was hilarious intentionally or unintentionally. The whole scene was a bit over-the-top and maybe even a bit awesome in a somewhat cheesy way, so my only real problem with it is that it felt out of place in this otherwise straight-laced drama. Josh doesn’t waste much time falling in with the local youth culture. Drawn in by Sky’s feminine charms, it isn’t long before he’s running off with Sky and her friends into the jungle. As you might expect, this is an immensely stupid idea. The “kids in peril” plot allowed for some cool moments of Taylor and his security team fighting off the Slashers, but I was pretty bored by all the time spent with Josh and his new friends. I liked that the writers attempted to subvert the trope of a helpless female by making Skye something of a gutsy leader, but her scenes with Josh are still fairly irritating. And none of the other younger characters are developed or made likable, so the scenes where they’re in peril don’t have the impact that they should. For a moment, I was impressed that they actually killed off Tasha for her immense stupidity. Of course, Steven Spielberg is producing, so while adults can be violently killed at any moment with no fanfare, all kids are magically immortal. At least the characters are allowed to shoot at the dinosaurs, which simply wasn’t allowed in the “Jurassic Park” movies. There is a bit of a worry that the show will fall prey to the dreaded “red shirt syndrome”, which is made worse when there’s an obviously limited amount of red shirts available (à la “Star Trek: Voyager”). But this could easily be remedied by bringing in a new batch of travelers from the alternate far future. Speaking of which, this is a rather useful built-in vat of story potential. “Terra Nova” has already established that there may be some sort of sinister, ulterior motive for the establishment of Terra Nova (“Control the past… control the future.”). Add to that the involvement of the “Sixers”, who oppose Taylor, and it makes a lot of sense that subsequent pilgrimages would serve to further escalate the conflicts brewing on Terra Nova. In spite of its many problems, “Terra Nova” remains a highly appealing production. It’s exactly the type of thing I loved watching as a kid. I’m a bit more of a discerning viewer than I use to be, but the kid in me will be able to look past its flaws and enjoy it as fun, sci-fi entertainment with humans surviving in an alien world (sort of), fending off hostile factions and all manner of prehistoric life, at least for a while. Not to mention, Terra Nova seems to have its share of secrets and mysteries waiting to be explored. That said, the writing and acting really does need to improve to hold my interest in the long-run. My hope is that a lot of the show’s biggest problems stem from the “pilot effect”.